Here's my sixth DNC Video Blog Report: The Statue of Liberty Gang. It's a short preview of a video I'm editing together of a group of women artists in Boston who dress up as the Statue of Liberty to promote a peaceful, friendly, terror-free environment. Clark's fiery performance knocked the GOP-style stuffing out of the veterans' event, turning it into a Bush-bashing barnburner. Hey! I was there too. And I had that speech on tape. 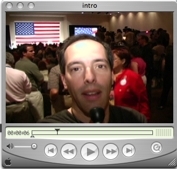 So I've edited together another Video Blog report from the DNC. This one shows the excitement of the crowds in the lobby of the Sheraton Boston hotel. Just outside the hotel volunteers were handing out flyers inviting the public to the Veteran's Caucus. I'd already registered online with the Kerry campaign. Once upstairs, it was chaos. Hundreds of people were trying to get inside the ballroom, but most of the doors were closed. One of the doors opened, but we were all told that it was just an exit and we had to move down to other doors. I just happened to be standing there when someone else exited and I politely asked if I could enter. The doorwoman looked at me and my camera and asked, "are you media?" I replied, "Yes I am." and was allowed entry. Nice. Once inside, I saw that the hall was already packed and no seats were available. How were they going to fit everyone? Then I heard a rousing speech from the stage. When I looked up, I saw that it was a meeting of the African American Caucus. So I filmed some of that and then they ended thier meeting a half-hour late. Someone got on stage and asked anyone who wasn't a veteran to leave and make room for the veterans. That didn't make sense since the Kerry campaign invited everyone in, as did the people out on the sidewalk. The national anthem was sung, James Carville came out and got everyone fired up, then Wesley Clark came out and raised the roof. Here's Wesley Clark speaking to the Veteran's Caucus today in the Sheraton Hotel Ballroom.